This questionnaire has been developed by academic researchers. By answering these 17 questions you may learn more about your own worldview, as well as about the worldviews of others. The test has been shown to produce fairly consistent and interesting results. Your answers will indicate which of the four major cultural worldviews (defined below) describes you best, as well as the worldview to which you are most opposed. After taking this short confidential questionnaire your results will be immediately sent to your email address. This worldview test is primarily the brainchild of integral researcher Annick de Witt. In her research, De Witt used both qualitative (interviews) and quantitative methods, including large-scale surveys with representative samples of citizens in the Netherlands and the USA. Her aim in developing the test was to create an empirical, social science approach to mapping worldviews. Her research confirmed the existence of at least four major worldview-groups in the Western world, which she describes as “traditional,” “modern,” “postmodern,” and “integrative.” The existence of these worldview-groups has also been confirmed by work in sociology, the history of philosophy, and developmental psychology. These worldview-groups differ significantly in their political preferences, their attitudes towards climate change, the sustainability of their lifestyles, as well as their positions in ‘hot’ societal debates such as on the role of biotechnology. An article presenting the results of this study is currently under review in the peer-reviewed Journal of Environmental Science and Policy. ICE Caveat: Accurately assessing human worldviews is a complex undertaking. In our opinion, none of the various test instruments currently used by social scientists or organizational development specialists can adequately assess a person’s actual worldview with objectivity. Nevertheless, we like De Witt’s questionnaire and want to support her work in this area. And at the very least, answering her 17 questions provides an opportunity to reflect on the distinct worldview frames that make up the political spectrum in most of the Western world. Annick de Witt (Ph.D.) is an author, change-maker, and consultant in the field of cultural and inner transformation for global sustainability. She has extensively researched worldviews and culture, and has published about these themes in books, academic journals, and the popular (Dutch) press. For general information, to receive updates, and for questions or comments go to her website annickdewitt.com. For more information on her academic work visit this link, where you can download her publications. In traditional worldviews the religious sphere is generally not distinguished from the secular sphere, nor is metaphysics from science. Religious or metaphysical views on reality thus answer the big questions in life, and substantial faith is placed in religious authorities, such as scriptures, doctrines, and leaders. In this worldview, a transcendent God is usually seen as separate from the profane, earthly world, and man as fundamentally different from nature. The relationship with nature is frequently understood in terms of ‘dominion’ or ‘stewardship’. Traditional worldviews tend to emphasize the importance of family and community, as well as values such as honesty, decency, sobriety, obedience, discipline, solidarity, conformity, service, dedication, respect for tradition, humility, and self-sacrifice. In the cartoon graphic above, this worldview is symbolized by the presence of the church, the agrarian landscape and lifestyle, and the religious figures. The policeman symbolizes a respect for authority and tradition, obedience and discipline, rules and order. Modern worldviews attempt to achieve liberation from imposed, oppressive, frequently religious, authorities and understandings of the past, through an emphasis on rationality and critical thinking. The vision of reality tends to be secular and materialistic: the existence of a higher power, divine reality, or intangible dimension is generally rejected. Science is frequently seen as the ultimate (and even exclusive) source of reliable knowledge, providing access to objective reality. This ‘objectification’ of reality generates a dualism between body and mind, and object and subject, which tends to lead to immense scientific, technological, and socio-economic progress as well as an instrumentalization of nature. Science and technology are generally seen as central means to address humanity’s most pressing issues. The autonomous, ‘self-made’ individual has a central position in this worldview. Individualistic and hedonistic values—such as freedom, independence, success, performance, social recognition, comfort, and fun—are usually dominant. In the cartoon graphic this worldview is symbolized by the modern, standardized, functional style of architecture, smoking factories, airplanes, and the rise of global (fast food) corporations. The chemical scientist in the front points at the scientific-rational nature of this worldview, which results in both a philosophical materialism (there is nothing beyond what is empirically observable) as well as an axiological materialism (value and meaning in life is found in the material realm), as symbolized by the business man and the bag of money he is holding. Postmodern worldviews are characterized by a tendency to acknowledge and value multiple perspectives on reality, and are generally critical of modern science’s claim to exclusively provide objective knowledge. This worldview instead emphasizes the relativity and contextuality of knowledge, as well as the value of moral, emotional, and artistic ways of knowing. Frequently a somewhat critical attitude towards the modern model of society (e.g., ideas of progress, modern science and technology, capitalism) is observed, and the emancipation of marginalized and oppressed groups is a central motivation. This is for example reflected in the rise of social movements since the 1960’s, promoting peace, multiculturalism, gay rights, and the environment, among others. Generally, postmodern worldviews celebrate diversity, heterogeneity, relativism, and ‘post-materialistic‘ or ‘self-expression’ values such as creativity, uniqueness, authenticity, imagination, feeling, and intuition. In the cartoon graphic this worldview is symbolized by the creative and playful ‘postmodern’ architecture, the colorful – diverse, expressive, authentic – crowd marching for typical postmodern concerns such as peace and justice, and by the courthouse in the back. Integrative worldviews appear to be primarily characterized by a self-reflexive attempt to bring together and synthesize elements of other worldviews, or of domains that in other worldviews tend to be viewed as mutually exclusive, such as science (or rationality) and spirituality, imagination and logic, heart and mind, humanity and nature—perspectives that in the West have been in conflict for centuries. In this worldview, such opposing perspectives are frequently understood to be part of a greater whole or synthesis—on a “deeper level”—resulting in “both-and” rather than “either-or” thinking. Such a holistic or integrative perspective may lead to a profound sense of connection with nature, and an understanding of earthly life itself as imbued with a larger consciousness or “Spirit.” Universal, existential concerns—such as life and death, self-actualization, global awareness, and serving society, humanity, or even “life” at large—are often of central importance. 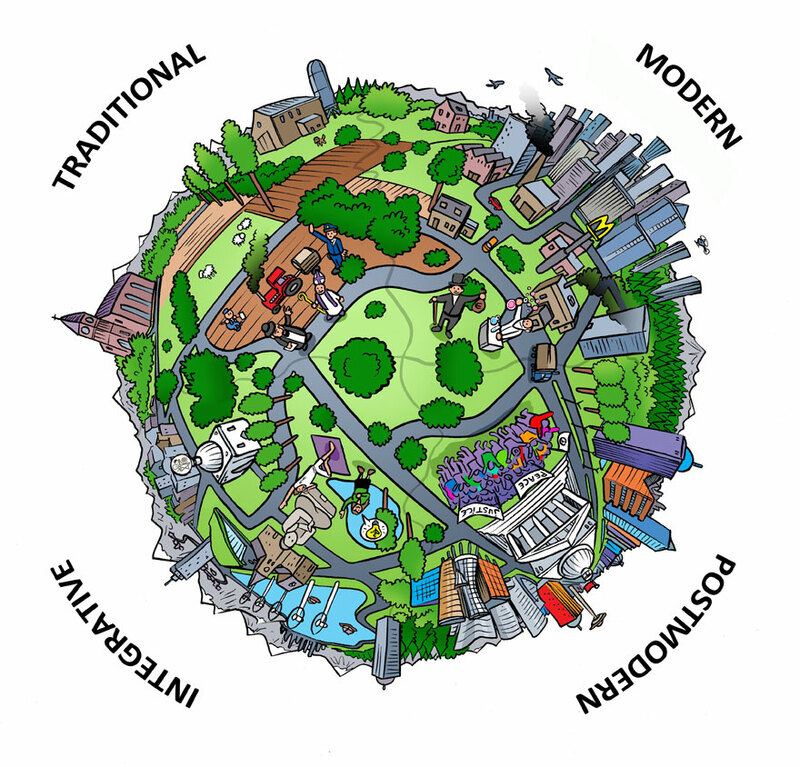 In the cartoon graphic above, this worldview is symbolized by the green, social entrepreneur who integrates (modern) entrepreneurial spirit with (postmodern) idealism and concern for oppressed others. The person on the yoga mat holds a mobile phone in his hand, symbolizing the integration of century-old spiritual practices with modern technologies. Religious and spiritual expressions are diverse yet tolerant of their differences, as we see in the varied sacred buildings. The water points at the self-reflexive nature of this worldview, and the wind turbines and green roof show its commitment to global environmental values. A very interesting assessment. Seems to have rated me accurately, though it would be good to include some sort of strength interpretation, e.g., how strongly am I so-and-so? I was rated a 6 on both my ‘most’ and ‘least’ categories, but I don’t know what that means. In addition, there is an obvious bias against the Traditional in the wording of the Modern explanation. Don’t know if you intended it. The first sentence in the Modern is full of denigrating terms, clearly depicting the Traditional: “liberation from imposed, oppressive, frequently religious, authorities and understandings of the past.” None of the other explanations start with such a stark statement discrediting another view. Additionally, it is hard to imagine that this statement does not also apply to the Modern itself, as well. Anyone who has studied the process involved in the advancement of science, knows how difficult it is to “achieve liberation from imposed, oppressive authorities and understandings of the past.” Once established, it takes nothing short of a ‘revolution,’ as Kuhn states, to change scientific theories. I ask you to think about removing this first sentence, or at least modify it. I appreciate that this assessment gives me and my students a way to begin thinking about worldview. It opens up some rich discussion in my classes. These four worldviews are here depicted around a circle or as equals. That is a way to see them simultaneously as each taking turns without preferences. But at least the Traditional and Postmodern worldviews are typically associated with the political left and the political right and could be depicted as co-equal, complimentary or next to each other. The Traditional (let’s place it on the right) is normally associated with conservatism and the Postmodern (let’s place it on the left) is normally associated with liberalism. I suppose that – generally speaking – the Modern worldview could be to the right of the Postmodern Worldview and to the left of the Traditional Worldview. It could also be in-between the Traditional and the Postmodern having some people leaning to the left of the political spectrum and others to the right as per different individually chosen positions on different issues. Finally, these worldviews can be depicted occupying a vertical, ascending column with Traditional at the bottom and Integrative at the top. This would emphasize greater degrees of openness and inclusivity, the bottom worldview needing rigid direction and the upper worldview more flexible and open to all considerations. In some Integral Community conversations the conservative Republicans and the liberal Democrats are depicted under the second form of depiction previously described or as side by side and complementary but we could also see their relation vertically with the conservative as less evolved in that it is unable to take in as many perspectives than the liberal. Thus we can have three forms of depiction: Circular from a less differentiated “bird’s eye” view perspective, side by side, or mutually necessary and complementary from an egalitarian yin/yang type of perspective and also vertically, with the Traditional as less inclusive or “evolved” in self-identity, flexibility and values whilst the Liberal is more inclusive or “evolved” in self-identity, flexibility and values. It may not be politically correct to emphasize the latter depiction and, whether true or not, may cause greater resentment and counter attacks among the conservative feeling judged as inferior but, from an integral-integrative perspective, this third explanation should not always be avoided. I love this. Not that you’re describing your imperfections, but that you HAVE imperfections. It’s nice to know that I am not alone when it comes to dirty floors, as well. Also, don’t even look in the master bathroom! Giorgio, this seems very insightful, but my tired brain today can’t envision it. Might you consider making a visual of all these different ways of representing the relationships amongst the worldviews that you are intuiting? Haven’t read my results yet, but the test seemed narrow toward religion, it left no room for non religious Christians. I think her overall view of those that believe in God seems dominated by religious leaders and legalism. For example the question that asks if you look to religious leaders and tradition, that was unfair. I look to God through his word. My relationship with God and my faith is not dominated by works and or tradition. It is living and real. So, no I don’t look to religious leaders, I look to God, but there really were no relevant choices. Just some thoughts…. This questionnaire has three categories – Traditional (Red/Amber), Modern (Orange), Postmodern (Green) – on Integral 1st Tier. Only one category on 2nd Tier, and none on the 3rd Tier. Yet I would suggest that impact of those on 3rd Tier (Cook-Greuter’s 5/6) is huge – and well known – and already an ever increasing part of society. Gandhi, King, and Mandela are just the public faces. And these people aren’t seen as divine – as having “unobtainable” stature – as is often attributed to Cook-Greuter’s 6 (Unitive). Perhaps we aren’t looking “high” enough? What you look to, focus on becomes your destination. What happens when it isn’t called out, left off the map? How would a questionnaire that included 3rd Tier “read”? How many people on 2nd Tier have 3rd Tier as their growth edge “ego development” level. How many people might respond to a 3rd Tier category and and say – “yes – that is the response I agree with most”? Integrative worldview but not holding an Integral perspective as represented by such writers as Ken Wilbur or Steve McIntosh. Poetry, literature, story telling,yoga, qigong, martial arts, meditation, music, nature, films, unending enquiry into the mystery of life, intimate relationships- that is what frames my perspective. Your comment caught my special attention. Your worldview is “integrative,” you say, but what you have called your “frame” is actually just a list. It is precisely a frame that is needed. How are the various items integrated in your worldview?